The 1222-E is the electric version of our most popular commercial unit, the 1228-G. This is a compact and lightweight system with superior cleaning performance utilizing the Ultra-Cavitation technology. This unit comes complete with a 20hp industrial grade, multi-voltage, 3-phase electric motor with a 1 year manufacturer's warranty. This unit also comes with General Pumps TSF series pumps boasting an impressive 5 year manufacturer's warranty. The portable and easy to manuever powder coated steel frame comes complete with a lifetime warranty. This unit is ideal for small to mid size boat hulls, piers, pilings, seawalls, running gear, out drivers, pool and indoor underwater installations. 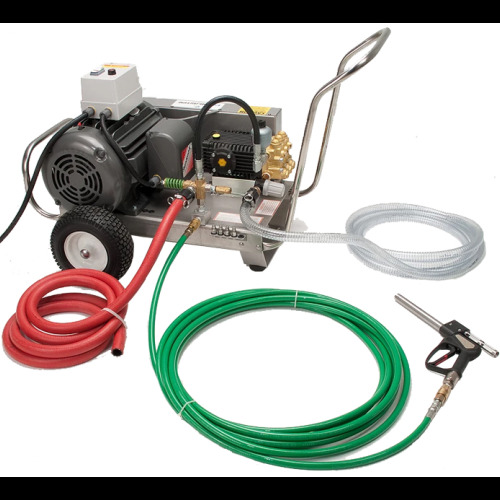 Standard accessories include zero-thrust balanced gun, 15' feed hose with electric suction pump, 15' of by-pass hose, 50' of 1/2" nuetrally bouyant high pressure thermoplastic hose, pressure washing gun/wand assembly and 4 pressure washing tips. Unit can also be utilized as an unbalanced 2 gun system. All electric units comes in a 50hz or 60hz option.